Make your dome your own, with our accessory and customisation options. 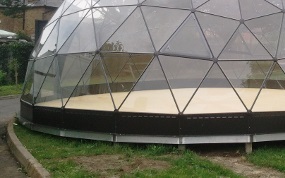 We can provide a range of accessories and advice to help you maximise the investment in your Solardome® geodesic dome. Please contact a member of the team to discuss any of the options below or for further information and advice. 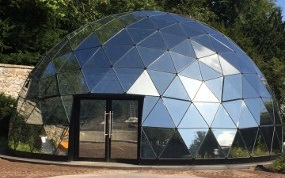 Our domes come in white (external) and aluminium (internal) as standard, but brown (RAL 8080), grey (RAL 9006) and green (RAL 6010) frames are also available. All domes come with a double-glazed UPVC door as standard. If you’d like more, there is the option to have up to two additional doors (excludes the Solardome® Pod). Doors are UPVC as standard, or can be made from aluminium if required. We can also supply double doors and bespoke doors. We recommend additional roof and/or side vents, particularly for warmer climates. 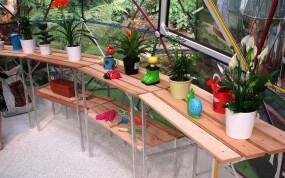 Each glasshouse is supplied with a number of roof and side vents, depending on the model. Please see the specification section on each product page for more details. 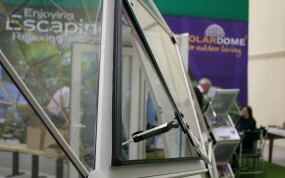 Our Solardome® Haven, Retreat and Sanctuary glasshouses can be supplied with an integrated base. This reduces ground preparation work and removes the need for flashing. The integrated base has a metal frame with heavy duty wooden exterior grade panels for the floor. It has been designed to fit our domes perfectly and has been structurally tested to British standards. 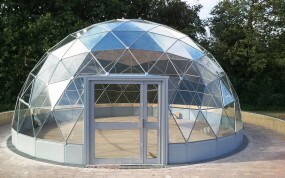 We can provide UV reflective film, safety film or coloured film to cover the top section of the dome. These films are a permanent feature and have a 5-10 year guarantee (depending on the film chosen). All films block 99% of UV rays. Why not replace one of your glass panels with one of our 4mm powder coated aluminium flue panels? 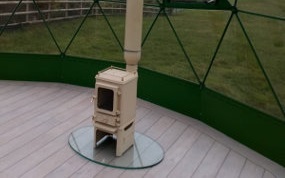 It is designed to allow a 100mm or 150mm flue pipe to pass through, allowing you to have a wood burning stove inside your dome. Perfect for those chilly – yet cosy – evenings! You can also choose to powder coat the internal frame in different colours. 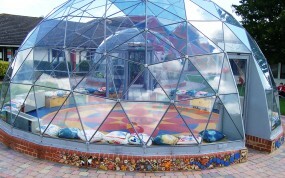 This highlights the geodesic shape of the dome and is chosen by many of our educational customers as it adds to a fun environment for pupils and helps them identify patterns in the structure. 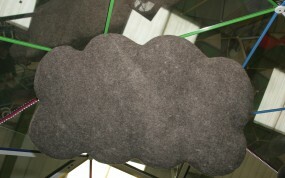 We can recommend creative acoustic absorption products to help manage the distinctive acoustics within the dome. They also act as an added source of inspiration to the environment, particularly for young students. If you plan to have more than one dome in your grounds, we can link them together with small tunnels or merge them to create a mini-Eden style design. This is especially useful if you are creating a multi-functional setting using separate domes for different purposes. 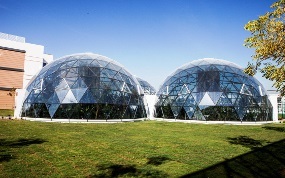 We can also link or attach domes to buildings. Our staging units are made from aluminium frames and treated cedar wood panels. Each unit is designed to fit its relevant dome model circumference. We can provide one and two-tier staging units. 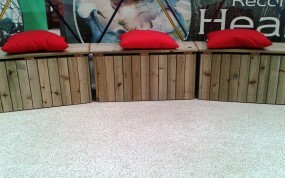 We provide bespoke seating to go in your dome. We have designed a set of wooden seats that fit around the circumference of each dome model. There is storage inside the seat. If you would like to intersperse seats and plants around the perimeter, we can provide edge planters, which are the same size as the seats. This helps when classes split into group activities. 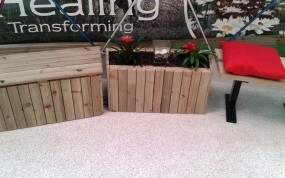 We also provide large wooden planters. 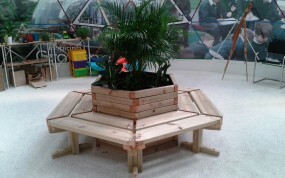 These planters are good for the central areas of the dome and create a large work area for group activities. Each planter is 70cm high. Shown here with the option of additional seating. Please note that while would be pleased to provide staging and furniture for your dome, we are unable to install it if bought separately to the dome. These pieces of furniture are supplied flat-packed and will incur a packing and delivery charge.